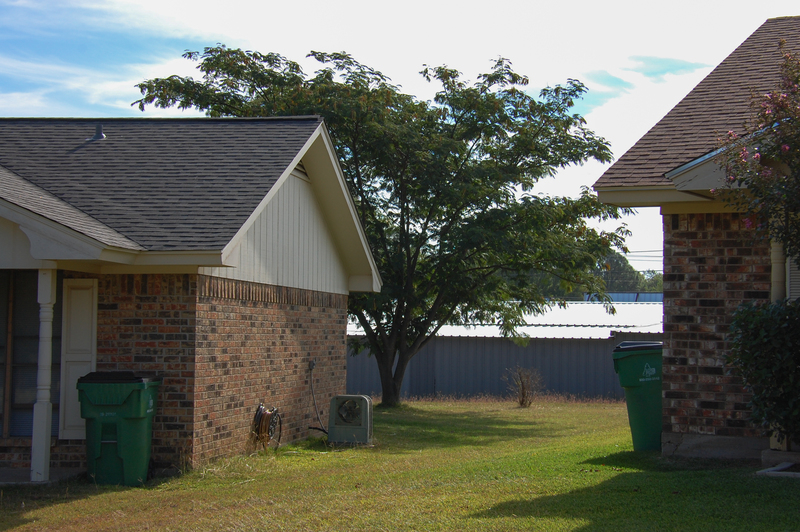 A former Tarleton State University professor resigned after a report that he participated in a ritual in which he pierced his pectorals and hung from a tree in the presence of students. 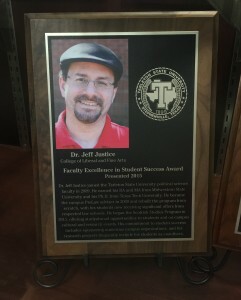 Justice began teaching at Tarleton on September 1, 2009, according to the Texas Tribune. In a statement to Texan News, Dr. Jeff Justice acknowledged that he “attempted to harm myself in the presence of students. While I do not recall what initiated such action, I do know this incident was caused by the accumulation of events in my life that resulted in me entering a state of severe depression. “As the result of those ongoing events in my life, I made the decision to resign from my position at Tarleton State University,” he said. “Such decision was made after diligent reflection of myself and upon the advice of my doctor.” To read the full statement, click here. 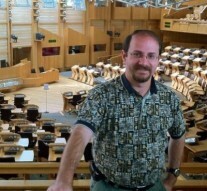 Justice was an assistant professor of social science at Tarleton State University, and was known for his well-attended study abroad trips to Scotland. A plaque with his picture sits in a glass case on the second floor of the O. A. Grant Humanities Building awarding Justice with “Faculty Excellence in Student Success” in 2015. 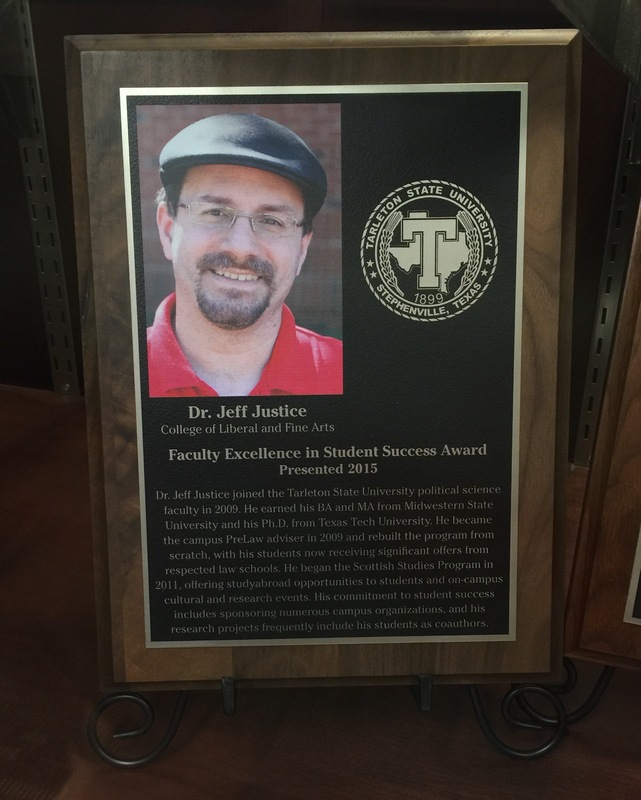 Justice received a Faculty Excellence in Student Success Award in 2015. The May 18, 2015 police report is based on a nine page, handwritten statement submitted by a single unidentified student who says he witnessed the ritual. To read the statement, click here. A police report accompanying this statement said “Professor Justice has not broken any laws other than offering alcohol to underage students, but has violated Tarleton policies.” To read the police report, click here. In his statement, Justice denied furnishing alcohol to minors. The records then report that Justice explained the ritual to the students, detailing that he had been performing it since he was 13 years old. A tree outside the duplex where Justice lived on Willow Lane. According to the report, Justice then took the students outside and performed the ritual, which involved hanging himself from a tree by ropes attached to stakes piercing his pectorals. Afterward, the student said Justice led the students back inside his home, where he tried convincing them to do it themselves. “He then came over to where I was sitting and asked if he could pinch my chest,” the student said. “Then he felt on my chest and said yeah, the stake would go right through here. Texan News requested Justice’s personnel file and other records about the incident from Tarleton under the Texas Public Information Act. Though the university released the police report, it has yet to release other information requested and has instead asked the Texas Attorney General’s office for permission to withhold it. In a second letter sent on August 28, 2006, Justice was informed that he was “ineligible for rehire with the Texas Tech University System or any of its components.” To read documents from Texas Tech, click here. Justice also has been involved in the Boy Scouts of America. He is listed on the Southern Region Venturing Boy Scouts of America website as a former Southern Region Associate Advisor. He had been involved in a part of the Boy Scouts, according to a series of Facebook posts that have now been deleted, known as the Order of the Arrow, which also is known as the National Honor Society of the Boy Scouts. Justice frequently posted information about the Boy Scouts and the Order of the Arrow on his Facebook page, which is no longer in service. Does this article need to exist? I am not sure there is any news here. What we have is a former Tarleton colleague who is going through tremendous personal turmoil and had an vulnerable moment (in an obviously inappropriate situation). He already has paid a heavy price for his professional indiscretions. Why air his personal issues publicly for all to read and gawk at? Do we need to shame him any further? I don’t see how this helps him. People need to remember that PEOPLE ARE PEOPLE. This man’s job does not absolve him from humanity. It doesn’t strengthen his resolve. If nothing else, the stress of leading others is often more than some can bear without assistance. To chastise a person for having his or her own life, making choices which are personal and meaningful, and even failing to meet his or her own standards of professionalism or personal goals is to forget one’s own limitations and needs. Okay, he provided alcohol to minors. For that, he should be charged, if the evidence is enough to convict. If not, leave the man alone, other than offering sage advice or assistance from an official agency which may provide support. You want to ruin someone’s career? Choose any politician you like, and go at it. Hello, every time i used to check web site posts here early in the break of day, as i like to learn more and more. Hello, I want to subscribe for this webpage to get newest updates, so where can i do it please help.